On March 29, 2014 an Italian Greyhound defied the odds after a stroke. His life changed forever in an instant. One minute Ricochet was running around with his canine housemates in the yard, “ricocheting” off anything he could find to jump on, and the next minute he was lying on his side, unable to move and gasping for air. Ricochet had a type of stroke called Fibrocartilaginous Embolism (FCE). When Riochet’s pet mom, Renae Moore, found her dog on that terrible day she knew she had to take immediate action. She and her husband placed the little guy in their van and rushed him to their veterinarian’s office. During the ride, Ricochet’s tongue and gums turned blue and his pulse became so weak that Renae began CPR to save his life. A set of X-rays were done at the veterinary office, but didn’t show any signs of an orthopedic injury to his spine. Ricochet was then transferred to a specialist who discovered the little dog had a FCE stroke. The condition is caused when a small fragment of disc material inside the spine breaks off and drifts into the spinal cord. An embolism forms which blocks off the blood supply to the spine and causes paralysis. Victims of a FCE stroke are most often giant breed dogs, but smaller breeds like Italian greyhounds are at-risk as well. Ricochet was a brave during the whole ordeal and his family worked hard to get him back on his feet. He went through weeks of physical therapy and follow-up care at home. Little by little Ricochet learned to walk again. This wasn’t the first hurdle for the little greyhound. He was born at a puppy mill in east Texas and lived there until he was freed during a raid by an animal rescue organization. Then Ricochet was placed in the hands of a rescue group in Shreveport, LA. He was adopted by the Moore family 5 years ago. Two family friends started an online auction to raise funds for Ricochet’s mounting veterinary and rehab bills. 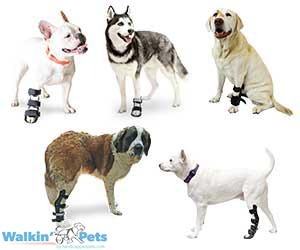 The proceeds went to buy special splints for the dog along with paying for his ongoing physical therapy and a special caregiver to check in on him while his humans were at work. Friends and family gave generously and all of the necessary funds were raised for Ricochet’s care. Here is a video of the Italian Greyhound’s journey. Click here to read: Would You know If Your Dog Had A Stroke? What a story!!! That video was amazing – loved seeing Ricochet walking/running at the end! Thank you so much for sharing this, Sharon. I will definitely be keeping up with his story. Thank you so much for sharing Ricochet’s story. I have been following his recovery since his Momma, Renae, posted in our Italian Greyhound group that he had suffered from an FCE. Your write up is wonderful. I definitely want to be updated on this story! He is so adorable!!!! Kirbysdawg, I will give an update after the auction is completed. How scary was that. So glad he’s on the road to recovery. Ricochet’s journey to recovery is an amazing one. I loved the video. Would like to thank mom and dad for sharing their videos and stories. It has helped many others. Thank you also for all your encouraging words and helpful suggestions to others. Hugs -Michelle S.
So glad he is getting better. So scary. What a scary story and so glad he is doing better. Hope the auction is a success and they raise all the money needed for Ricochet to get the therapy.